With some trepidation, I left the main highway at Magdalena, part way between Tepic and Guadalajara—in search of the railhead that a hundred years ago was the site of Mexico’s own little Auschwitz. I tend to think of Mexican cuotas—toll roads—as an additional layer of security for a driver. But I drove south over narrow country roads in bad repair and away from the cuota. Everything said agriculture, and nothing said narco. By that I mean that everything I saw had to do with farming, work, and time moving in sync with the growing seasons. No big pickups that had shiny chrome bumpers and were over-all too clean. No big guys with bellies, dressed casually and wearing gold necklaces. I had my map book Guía Roji, and I had gas. I had money, and I had a cell phone. And I had a goal. I was looking for San Marcos and a certain building just before it. I had no idea whether I would actually be able to approach the building, or whether it would even still be there. I had looked down on it from Google Earth, but I had no idea how old the satellite photo was. I could tell it was the building, because I could still see traces of the railroad that had run past it. I had also seen the great eucalyptus grove that stood beside it and is said to have grown over mass graves of Yaqui Indians (and others: Mayos, political dissidents) who 1906-1910 were captured—as many as 15,000 of them—in the state of Sonora, brought by train (boxcars) from Hermosillo to Guaymas, put on ships, disembarked in San Blas, then force-marched with little food and water roughly 300 kilometers for 15 to 20 days over the mountains from San Blas at the coast to San Marcos, the closest rail head at that time, 80 kilometers west of Guadalajara. Many of the prisoners were women and children. Men of fighting age were either still in the mountains east of Guaymas, the Bacatete, killed in battle, or executed as enemies of the state. For hundreds of years they had been defending their rich tribal lands and water against first the Spanish, then against Mexican hacendados with enormous, ever-increasing land holdings—while American money owned the mines, built the railroad right into the Yaqui lands, and needed cheap labor in the henequen fields of the Yucatan—where many of the Yaquis were sent to work and perish quickly as forced labor. Already in the 1870s, henequen growers in the Yucatan were in debt to North American rope manufacturers who needed the henequen fiber called sisal and whose backers (Hearst, Guggenheim Rockefeller, I have read) provided the finances to keep the farms operating. (http://www.saudicaves.com/mx/yaquis/). The cheap labor that they got included Mayans from the Yucatan, Korean indentured workers, Chinese, Mexican political dissidents, Yaqui deportees, and many other groups. By the 1870s, Mexico was supplying 90% of the world’s sisal, mainly for rope and burlap—the time of capitalism and empire, when the dominant nations had to have massive hawsers for their merchant- and warship fleets. Everyone got a cut from the sale of Yaquis—the Governor of the State, the “labor agents,” anyone with immediate control over the prisoners. I have read conflicting figures: 2.50 pesos at San Marcos, per head; or, 25 centavos, per head. Families were split up and sold (women and girls sold separately) in different directions at San Marcos. There is a long history of Indian children being given to white families around Hermosillo and Guaymas (before deporting their parents) so that they could grow up to be “civilized,” as opposed to “barbarian,” terms used freely in the times. There are few if any records. There is some recorded oral history: I highly recommend Raquel Padilla Ramos’s “Los partes fragmentados narrativos de la guerra y la deportación Yaquis” and John Kenneth Turner’s book “Barbarous Mexico” (1910), which exposed the genocide against the Yaquis. You can download it from Amazon. I could see the eucalyptus grove first. It towered over the rest of landscape. Then I saw the building. I wondered about access. I passed up the first left, barely a track. 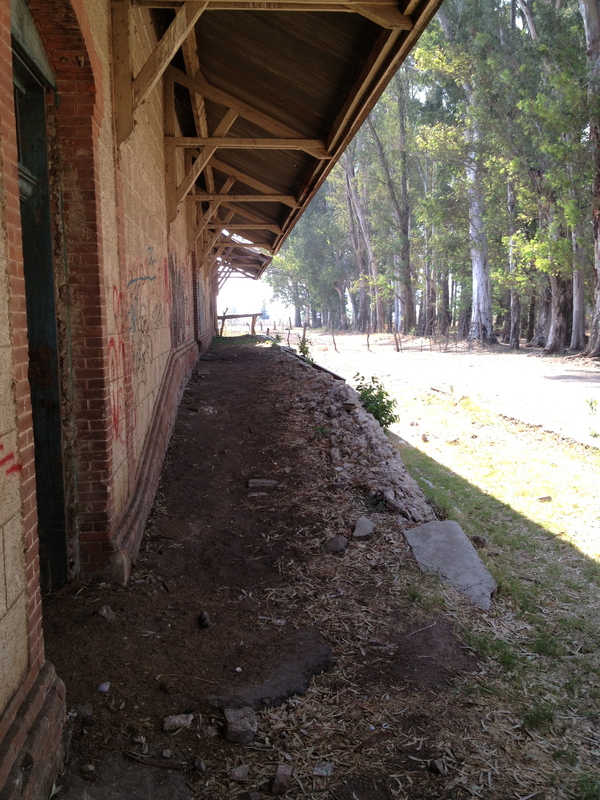 Then I saw a well-used second left, a dirt road leading into the north end of the station. I was able to drive right up to the station on my left and the grove on my right. As soon as I stepped out of my car, a small black dog began to hector me, begging to be fed and cared for—a more contemporary example of abandonment. I entered the building, with the dog on my heels. It was exactly the way I had seen it in photos: dirt floor, fairly intact corrugated roof and, everywhere, graffiti. There was no plaque, no sign, no reference anywhere to state or local protection, nothing of the history of the place. I wondered why it was still standing, still there. A hundred years had passed. Who owned the land, the building, and the grove? Why wasn’t the old station either torn down or used for something else? I walked into a few side rooms. Living in a country with so many buildings still carrying signs of history, I looked for clues. On the outside wall, where the trains would have stood, there are bullet holes in the wall. I found about fifty of them, some very low, meaning that the shots had been directed at people sitting or lying. At Buchenwald, out side of Weimar, there are bullet holes in the floor of a fairly small room with a drain in the middle. A sign said that Russian prisoners of war were executed in that room. They had been sitting or lying when they were shot. Two hundred feet to the west, there was a ruin of a few standing walls. The back wall had a great many bullet holes in it at various heights. That place seemed as if it was a more intentional execution site. For a while I had thought the impact patterns were also evidence of automatic fire that pointed to a later time; but now I am not so sure. Some of the train rails are still embedded in concrete near the station. There is a ramp up to the train level. The roof overhangs the platform on both sides of the station. There had been another two people taking dirt from a pile near the grove. They departed. That left me and the little black dog, that continued to whimper—placing me in the curious and ironic dilemma of offering my empathy to those who had suffered in this place a hundred years ago, while denying it to a creature who needed immediate help and might or might not ever receive it. Why did I seek this place out, and why am I writing about it now? Because I think it is important not to forget what we are capable of—murdering each other, enslaving each other for whatever purpose. That is why the Germans and Poles have preserved the concentration camps in those countries. Somebody appears to be protecting the San Marcos site, but also not wanting to advertise that fact—perhaps because the State or the Republic will not permit it. It is some kind of informal arrangement—and a mystery I cannot explain. I am not sure what percentage of its visitors have any idea what happened there. They come as picnickers or graffiti artists. But I suspect that some of them are also the descendants of the people who perished there or farther down the line—and I suspect some of them are Yaquis. I am writing a novel that begins in Tepic and ends in Huatabambo, Son. The year 1909. I learned about San Marcos more than a year ago and have used the Yaqui story in my novel. I lived in Tepic 1988-1993. Never knew this story. Went through Magdalena often on the road to Guadalajara. Your post and especially the photographs help me feel that I have now seen this place. I hope you had some food with you to give the dog. I think of the sick and abandoned outside the station who begged for food for more than a hundred years past. Thank you for this post. What nice note, Cynthia! I’m at sterlingbenn@gmail.com if want to talk more. I have written a novel called so far “Comandante Ibarra,” set in 1900, about a Rural who thinks the Mexican Constitution of 1857 should also protect the Yaqui People. It’s supposed to appear before Christmas. Saludos!